2. Meanwhile, mix the flour, remaining 2 tbsp sugar and salt in the bowl of a freestanding mixer fitted with a dough hook. Make a well in the middle and add the oil, eggs and yeast mixture, then knead for 6-8 minutes. (You can also knead by hand on a lightly oiled surface for 10 minutes.) If there's any dough stuck to the edges of the bowl, scrape it back into the main ball. Cover the bowl with cling film and leave for 1 hour-1 hour 30 minutes (depending on the warmth of your kitchen), or until doubled in size. 3. Once the dough has risen, you need to shape it. Lightly grease a large, clear work surface with oil. Divide the dough into 6 equal pieces. Roll the pieces into strands about 40cm long, tapering them slightly at the ends. Line them up on a work surface. Pinch the top ends together gently and braid the stands. 4. Pinch the bottom ends together, then tuck both the top and bottom ends of the challah under a little so no strands can come free. Carefully transfer to a large sheet of baking parchment and cover with a sheet of oiled cling film. Leave to rise for 45 minutes, by which time it should have puffed up nicely. 5. Preheat the oven to 180ºC, gas mark 4; put a large flat baking sheet that can comfortably fit the challah in the oven to heat up. 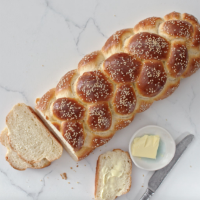 Brush the challah all over with beaten egg, taking care to get into all the nooks. Allow to dry for 5 minutes, then brush again with egg and sprinkle the sesame seeds. Slide the challah, still on the parchment, onto the preheated baking sheet and bake for 35 minutes until golden. Cool completely on a wire rack before serving. This recipe was first published in Fri Mar 22 15:58:45 GMT 2019.